For many drivers, safety and security is a major concern. To this end, the experts at the Ford Motor Company have come up with a new system that can help people to attain this goal. This new system is known as the Ford Co-Pilot360 technology suite, and it consists of a wide variety of technologies that are included in Ford trucks, SUVs, and even cars. 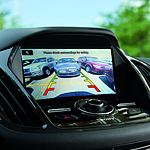 Two such technologies that will soon see wide use on most Ford vehicles are emergency pedestrian evasion as well as blind spot information services. While avoiding other vehicles and buildings is a priority for most drivers, it is even more important for these vehicular operators to avoid hitting pedestrians. To this end, the Ford Co-Pilot360 system equips drivers with the extra awareness that the automatic emergency pedestrian braking system can provide. This system deploys a number of sensors to identify and predict probable obstacles. It can then both warn drivers of these hazards and control the brakes if drivers are unable or unwilling to take action. Another system that performs the same action to the rear of the vehicle is the blind spot information system. Much like the backup protection system, the blind spot information service keeps close track of what is going on behind Ford vehicles. Like its forward facing companion, the blind spot information system can both alert drivers about possible hazards to the rear of their vehicles and bring these vehicles to safe stops whenever necessary.